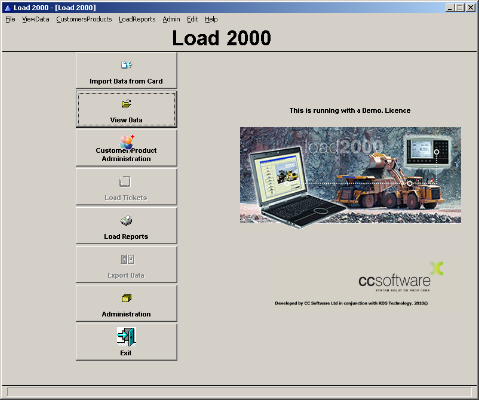 Load 2000 is our flagship materials handling software. It is designed to work in conjunction with various on-board telemetry weighing systems for wheeled loaders. CCS3 have worked closely with manufacturers of on-board weighing systems to create a software system that can easily report on every aspect of the real-time data collected by the weighing system using RF & GPRS modems. This software system can be tailored to meet your specific needs. The user interface is an easy to use, MS Windows based, menu driven system. You can import and process weighing data from the on-board telemetry weighing systems for wheeled loaders. The new Telemetry/LAN software uses radio modems or Hig h speed Ethernet, to collect and distribute real time weighing data, direct to/from the cab. An optional in-cab computer can be installed giving the driver full control of the weighing jobs and even connection to the corporate network. You can analyse load data by job number, date, product, or customer; print load tickets and other reports unattended or report across multiple sites. All of these facilities make this software ideal for either the small, mobile, lone worker yards or multi vehicle, multi-site corporate concerns. For non Telemetry weighing systems the software can import data from an SD storage card where manufacturers allow. Our telemetry system uses the latest Radio Frequency (RF) modems to transmit and receive load information between a personal computer and the on-board weighing equipment and allows for the produce a delivery tickets, data analysis and costing. We can achieve great distances using non licensed RF modems and even extend these distances using Mesh routing. Increased bandwidth modems would allow for in-cab audio communications or video feeds if required. This GSM/GPRS Module allows our on-board weighing system and Load 2000 to be released from the confines of single or linked sites. This system can now be implemented nationwide or even worldwide as long as there is a GSM/GPRS network to carry the data. Each vehicle will be fitted with a GSM/GPRS Modem connected to the in-cab weighing system, and the GPRS mobile network. CCS3 have worked closely with manufacturers to create a software weighing system that can easily report on every aspect of the real-time data collected by the weighing system using RF modems. This software can be tailored to meet your specific needs. Our Mobile system allows Load 2000 weighing system to be completely mobile making it ideal for small sites where no permanent structures exist or for temporary sites where a wheeled loader may not be based.